Petal Talk: (Almost) Weed-free: You Can Grow That! (Almost) Weed-free: You Can Grow That! For a gardener, weeds are like death and taxes -- one of the only sure things in life. Despite our efforts, weeds will find a way to benefit from the wonderful conditions created for desirable plants. I say it's time to put an end to their easy lives. While garden entrepreneurs have tried to make weeding fun, it's not always easy. I've heard of more than one person who has tried to save some money and use what's handy to do the deed. But here's a clue: if a method to get rid of weeds seems simple, it's either not safe, not effective, or will prove lethal to all but the weeds you wanted to kill in the first place. 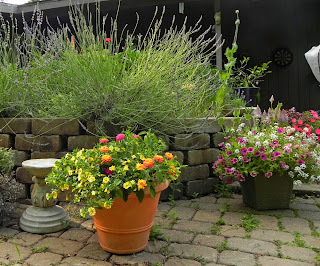 Ignore the flowers--look at the weedy patio cracks!! 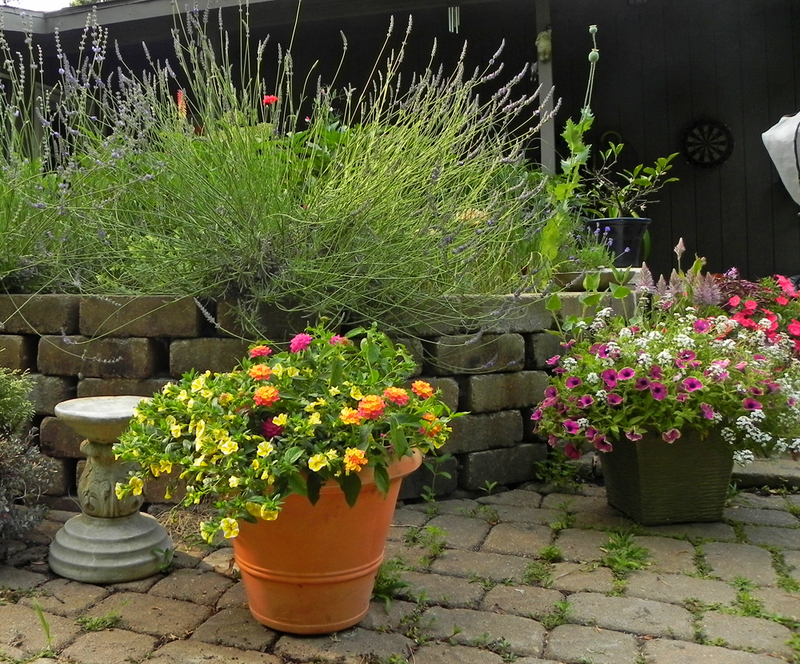 Cook them: Boil a pot of water and douse weeds in driveways, between pavers and along paths. Cover them: "Practical Science for Gardeners" author Mary Pratt recommends covering any bare ground as thickly as possible with a layer of some suitable material such as manure, chopped bark, old carpet or porous plastic membrane. Crowd them out: Pratt suggests growing desirable plants as close together as possible and immediately mulching areas cleared of annuals in fall to prevent weeds from gaining a foothold in mild winters. This one is my personal favorite, however, it seems to invite "Zelig" weeds. In a 1983 Woody Allen mockumentary, Leonard Zelig was a nondescript man with the ability to transform his appearance to that of the people who surrounded him. Some weeds have adopted this very behavior, usually outgrowing the very plants they emulate. It's where the well-worn saying, "If it looks too good to be true, it's probably a Zelig weed" comes from. How you deal with weeds is a personal choice, and there are dozens of gadgets with which to do it. 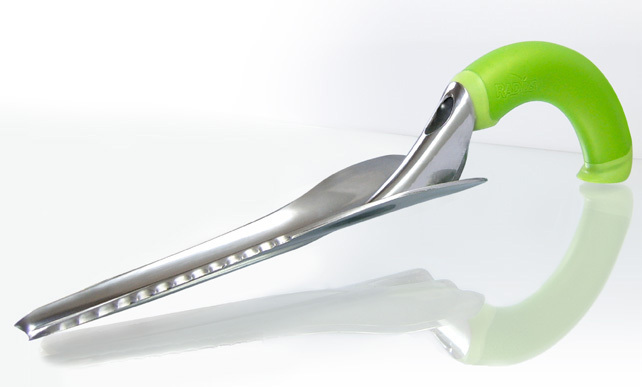 Garden entrepreneurs have been reinventing the hoe, coming up with dozens of incarnations of the original tool. It all boils down to the job at hand, soil condition, age of the weed and the gardeners' physical strength and stamina. 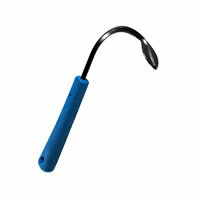 Perhaps not as much fun as a flame thrower but certainly safer is the Water-Powered Weeder, distributed by Lee Valley. The tool shoots a high powered stream of water alongside the root of weeds like dandelions, effectively making it easy for you to pull the whole root out. I usually turn to my CobraHead weeder or my Radius Garden weeder. Sorry but I actually like the patio with the weeds sticking out in the cracks. Granted if they would take over the place then it is another deal all together. I agree that using chemicals is a big no no and I have read people use vinegar as well although I wonder on the effects of that for the soil. Fancy tool that Cobra Head Weeder!! I know, Laila - it was the only photo I could locate that had weeds in it. Who takes photos of weeds, anyway? And the CobraHead is apparently an acquired taste, but I love it! I've actually used a small torch in some instances to control weeds. It is kinda fun. Laila, I've often heard of using vinegar for weeds but not yet used it, though I have used a product made from concentrated citrus oil. It worked okay but not worth the price. I like Jean's suggestion of crowding them out but I have not attained to that in many places yet. Thanks, Forest Keeper! The torch DOES sound kinda fun. Crowding does have disadvantages as it can give weeds a place to hide, so you still have to be pretty vigilant. Hi, Jean! I can attest to the efficacy as well as the danger of a flame thrower (weed dragon) method of weed control. I have a large, long gravel driveway and have used many methods to hold down the green driveway look! One gallon of vinegar with 1 cup salt and a tiny squirt of dish liquid soap worked for a short time, but was costly and t-i-m-e consuming. The weeds turned brown within a day and looked dreadful for a week, and the green of weeds showed their heads within another 2-3 weeks. The treatment only seemed to kill the exposed portions of plants, while the roots survived. Enter the weed dragon! Yes it is time consuming, but one 'treatment' was good for 4-5 weeks of summer! A must: have your hose beside you at all times ready for use. Who would guess?! A weed-free driveway looks great!